I’ve always been crazy for vegan sushi; in fact, I used to joke that I was "addicted" to my weekly avocado roll. It turns out, though, maybe I was! I have the hardest time with sugar addiction, and regular white sushi rice is seasoned with a mixture of rice vinegar, salt, and lots of sugar. Happily, I came up with this recipe for healthy, wholegrain sushi that lets me enjoy my tasty nori rolls without all that sugar and salt. When preparing this sushi for your lunch box, include a container of low-sodium soy sauce or Ponzu Sauce for dipping (see recipe below), and a bit of wasabi if you like the heat. When it comes time to fill and roll your sushi, there are dozens of delightful vegan fillings you can choose from. Avocado is my favorite, but you might also like blanched asparagus, red pepper strips, cucumber, sunflower sprouts, grilled shiitake, or fresh mango. 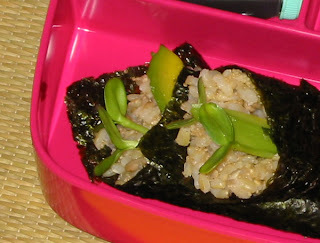 As I was experimenting with healthier sushi rolls, I found that brown rice alone did not get sticky enough to spread well on nori like traditional white sushi rice. I solved the problem by adding tasty millet and tiny amaranth to my brown rice. I found that cooking the three grains together resulted in perfect sushi rice, along with extra flavor and nutrition. A hint of lemon and the crunch of sunflower seeds add flavor and interest. Put the rice, millet, and amaranth into a medium pot and add 1 ½ cups water. Bring to a boil, reduce the heat to low and cook, covered, for 35 minutes. Remove pan from heat and let sit, still covered for another 10 minutes. Transfer the rice mixture to a large mixing bowl. Stir in the lemon zest and sunflower seeds with a wooden rice paddle or spoon, tossing the rice with light strokes to aerate and help cool the rice. Set the rice mixture aside to cool completely. When the rice is cool, spread ¼ of the mixture on a sheet of nori laid out on a sushi rolling mat (keep a small bowl of fresh water handy to dip your fingers and keep the rice from sticking). Leave a 1-inch strip at the top of the nori sheet uncovered. Arrange the avocado or other filling down the center of the rice. Use your fingers to lightly moisten the top strip of nori with a dab of water, then use the rolling mat to roll your sushi up and seal it shut. Transfer the roll to a cutting board and cut into 6 pieces with a sharp knife, wiping the knife with a damp cloth between cuts. This makes a refreshing, lower sodium alternative to plain soy sauce for dipping sushi. Combine all ingredients. Adjust seasonings to suit your taste. I was making vegan sushi for my kids' lunch today! If you have a rice cooker with a brown rice setting, something we splurged on several years ago, it will make great brown rice sushi. Zorirushi is the brand we have. Hi. My comment isn't related to this recipe specifically. I don't know how strict a vegan you (or your readers) are, but I notice you use stainless steel utensils sometimes and thought you might like to know they are almost always finished/polished with animal fat by the manufacturer. I haven't found any vegan ones yet. If you cook brown rice in a pressure cooker the consistency will be good for sushi.